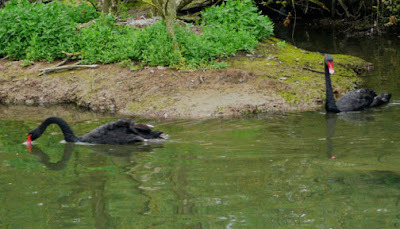 These are the two Black Swans that we have in our wildlife park on Fota Island in Cork Harbour. They have been there for a long long time now and seem a very contented pair and have a nest in the undergrowth at the top of the picture. 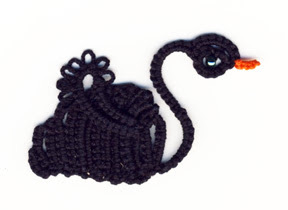 I wanted to make them in tatting but haven't seen a specific pattern for a black swan so I used one of the many patterns for a swan that I found. This one is another one of Martha Ess's Block tatted critters. Block tatting has a solidity about it that really lends itself to animals, I think they look much more realistic than more decorative rings and chain designs. 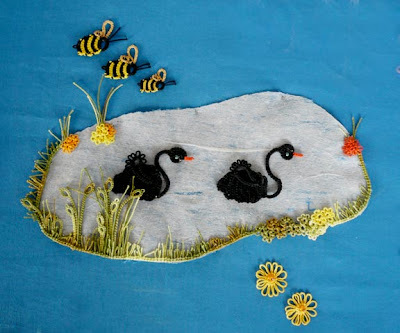 Here is my wildlife park pond with the two Black Swans. Oh! these little block critters of Martha's get cuter by the minute. Recently two little tiger cubs were born(created!) here in Ireland. I don't think there are many tatted tiger cubs in captivity around the world, I don't remember seeing any. Then yesterday they were joined by another, tiny as he is he was soon sitting up on the look out for mischief. I think that the first born must have got into a scrap as his tail has a nasty kink in it. There is no sign of their mum or dad, has anybody seen them? I finally got the hang of making these little fellas, they were all made with Flora thread, the older ones in 10 (5cm tall), and the little on is 20 (4cm tall). the thread is just the perfect colour. 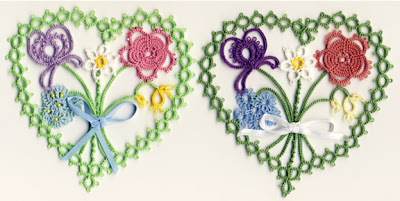 These designs are tatting perfection and there are lots more to choose from. Slugs and snails and puppy dogs tails........ goes the rhyme. Well I'll have to wait for Sid the Scintillating Slug a bit longer! one snail done, more to do so here goes with the puppy dogs and their tails. First cute little block tatted dog is another of Martha Ess's Little Critters one of my favorite tatting books of course, and he is a real cutie. The decorative join is easy to do and makes the little dog look as if it is sitting on it's haunches. He was quickly joined by a younger puppy! The bigger one is made in Coats Aida 10 in a lovely golden colour with a real shine to it. Eye beads are size 9. He is almost 5cm tall. The little fella is made in a vintage Coats Chain 20 and is 4cm tall, beads are size 11. I really like the chunkiness of size 10 for these little critters. they are very 'moreish' as each one ends up with a different expression especially as I still haven't fully got the hang of finishing off the head so it comes out different every time! They always come out with their heads held at a rather 'rakish' angle. The only other tatting pattern for a dog that I found was in Inga Madsens book of 'Tatted Animals' another favorite. This one is a lovely puppy too with a fab' expression. Easy to tat in one pass,but you need to be able to make an SCMR tho'. The patterns are in diagramatic form only with helpful instructions at the front of the book. I print out the diagrams and colour in each ring as I make it to help me remember exactly where I am. He was made in Coats Red Heart 20 (more like a 15!) is 11 cm tall and has a 4mm bead for his eye. 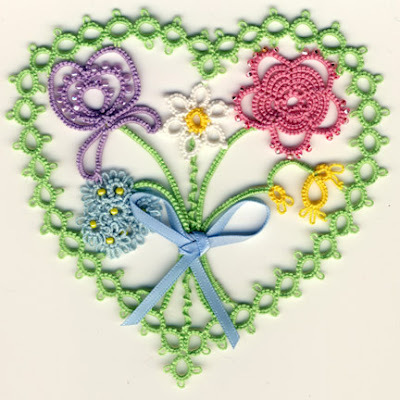 A beaded version of Martha's Flower Bouquet heart, see previous post for details about her new book Tats Amore. This version looks like a Spring Bouquet with it's mainly lighter shades compared to my original one which is now a Summer Bouquet.....mmm methinks an Autumn Bouquet would be nice too. But not yet just have to get back to tatting my challenge animals, I am way behind. Here are the two hearts to compare, I wonder which you like best. What should fall onto my doormat today but my copy of Martha Ess's new book Tat's Amore. If you haven't already heard about it do check out this link. I promise that you wont be disappointed, it's a cracker of a book. When Martha asked me a couple of months ago if I would like to be a test tatter for her new book to say that I was pleased would be the understatement of the year. As someone who never inherited any designer genes! I WAS DELIGHTED. Offered a tempting, mouth watering choice of designs the problem was which to pick as they are all lovely but my eye went straight to the Crewel Heart that I had seen on her website some while ago. I had thought it gorgeous then but the lattice centre looked as if it would be somewhat difficult to get looking even. But I love a challenge so that was the one for me. Martha's choice of colours of blue and silver was exactly what I would have picked so I had to do something different and leapt in with a central lattice of a fawny coloured Flora 20 and loved the result which looks like hessian. Was it diffficult...well after a bit of practice it was easy to get the spaces between the little rings relatively even. I am a Virgo and just read that Virgo's motto should be "Perfect is almost good enough!!" Mmmm I think that fits me allright!! Do have a go at this one because the result is well worth it. Burgundy on one side looked lovely but what to choose for the other more side was a problem. One of the attractions of this heart was a sort of ying/yang feel to the two sides of masculine /femininess. But a certain orange thread kept shouting at me 'Pick me, I will make it zing! and I am a complimentary colour after all!! And so here it is. Mmmmm couldn't resist trying a silver lattice centre next and it looks stunning, used Coats Ophir for this, together with a candy pink Flora 20 and a variegated Altin Basak 50. Each large heart has one or two smaller accompanying ones and here they are with a silver centre. they also look lovely with a variegated thread for the lattice. This little bag is being made from an itty bitty denim skirt that fitted a two year old, one of my many, many, many charity shop finds. The fabric behind will be used for the lining, a cut down elasticated belt and mmm those pockets are just crying out for little hearts. Just when I thought it was safe to get back to tatting animals for my challenge, Martha tempted me further with another heart to test. I thought that the Crewel Heart was my favorite 'till I tried this little beauty, this Flower Bouquet Heart captured mine. Another one of my favorite fiddly pieces I am sure you will agree that the result was stunning. I am now making this one again in brighter colours to show up against denim and going to add some beads for sparkle. The little heart to go with this one is lovely too. It looks so sparkly with beads that now there is competition to see which hearts go on the denim bag. Thanks Martha for your lovely book, the pleasure has been all mine....and lots more hearts still to make.